Olava the Fair, a Nord commoner, is a Layman of the Nine Divines and the Living Saint of Mara at the Great Chapel of Mara in Bravil. Her duties as Living Saint seems divided between praying and simply being there for those in need: She sleeps in the Chapel Hall every night between midnight and 6am and spends the first three hours of the day wandering randomly around, visiting all three areas of the Chapel. At 9am, she will head to the altar of Julianos and receive a few blessings before sitting down on a pew for a three-hour prayer. 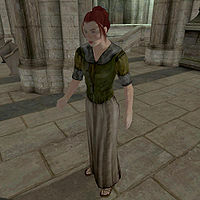 At 12pm she will stroll around the Chapel again until 4pm, when she will head to the altar of Akatosh and receive her second blessing of the day, followed by yet another three hours of praying. At 8pm. she will head to the Chapel's Great Hall for a two-hour dinner. After her meal, she will take one last walk around the Chapel until her bedtime at midnight. She wears mixed set of common-lower class and common-middle class clothing, consisting of a green wool shirt along with light brown linens and a pair of braided leather sandals. She carries the Chapel's key and a leveled amount of gold. She takes her role seriously and thinks she must serve as an example of what the other people should do, as she will tell you when you first meet her: "I am Olava the Fair, Mara's Living Saint. It is my responsibility not to preach, but to live Mara's commands as an example to others." If you ask her about Bravil, she expresses her feeling about the people inhabiting it: "My task is to know and love the people of Bravil as if they were my own children. If you have ever been a parent, you know what a challenge that is." She is killed after completion of the Nature's Fury quest. When this happens nobody will replace her, as she doesn't offer any kind of service.